Another predominantly pastille book! Have the printers run out of any other colour range? I have decided the next book I review will be black with huge luminous green writing - just for the hell of it. I need some variation. Mind you, if you love the chicklit genre and celebrity culture, this is the book for you, even if you're as sick of pastille book covers as I am. Don't let the cover put you off! Yes this is a romance, yes this focuses on celebrity, yes this is a bit tedious in places, but yes I liked it. I'm almost ashamed to admit it. It seems I have more a of a leaning towards this sort of thing than I thought. 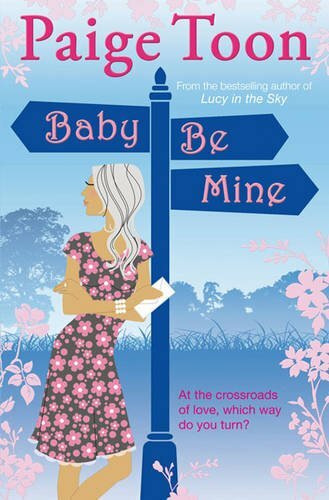 Meg's baby is always her priority, and the book spends quite a bit of time showing how responsible Meg is as a mother so it did focus on other themes other than romance, although I did find it all a little shallow. There were a few bits in the book that puzzled me too. Meg has a fling with someone mid-plot and Paige Toon hints at a past where this man had to fight for his living and mentions a distant look in his eyes - no further explanation is given. I got the impression that the author had plans for this character that never actually got to print. I suspect if you dream of one day living in LA surrounded by A-list premieres and sky blue swimming pools - you will absolutely love 'Baby Be mine.' Meg is whisked away to beautiful locations on the back of a motorbike, is showered with gifts of new cars, credit cards with no limit and is treated to all the trappings that money can buy. Every now and then I found myself rolling my eyes at the excessive luxury - but that is central to the plot so I suppose I can't complain too much. Anyway! Baby Be Mine was as addictive as an episode of Saturday night trashy TV, you can't tear your eyes away from it, but you know you should really be doing something useful like picking the blu-tac out of the carpet maybe. This isn't a great book by my standards (but what do I know! ), but it's certainly compulsive reading. Go on...grab a copy and drift off into a lifestyle that most of us can only dream of! If you'd like a copy of this book it is published by Simon and Schuster and can be found here for £5.91 (precisely). Perfect for slotting into your beach bag as you saunter down to the sunbeds on your summer holidays.